Mahindra is set to launch the XUV300 on February 14, 2019. Earlier this week, the variant-wise features were leaked. 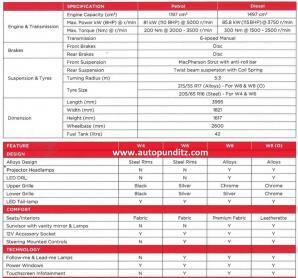 Now, another leaked image sheds some light on the specifications. The Ssangyong Tivoli-based XUV300 measures 3,995 mm in length, 1,821 mm in width and 1,617 mm in height. It has a wheelbase of 2,600 mm and comes equipped with a 42-litre fuel tank. The XUV300 will be offered with petrol and diesel engine options. 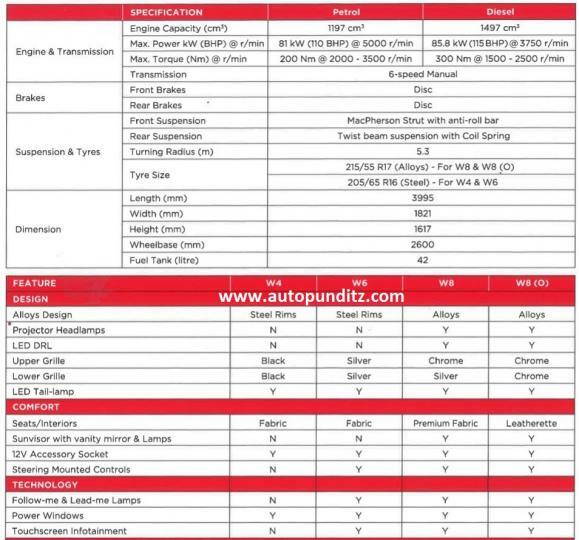 According to the leaked image, the 1,197cc petrol engine produces 110 BHP @ 5,000 rpm and 200 Nm of torque @ 2,000-3,500 rpm, while the 1,497cc diesel unit puts out 115 BHP @ 3,750 rpm and 300 Nm @ 1,500-2,500 rpm. Both engines are likely to be offered with a 6-speed manual gearbox. The XUV300 comes equipped with disc brakes at the front and the rear. The W4 and W6 variants are expected to get 16-inch steel wheels shod with 205/65 R16 tyres, while the W8 and W8 (O) variants get 17-inch alloys wrapped in 215/55 R17 tyres.